Members of the Army Reserve Marksmanship Program competed at the 56th Annual Interservice Pistol Championships hosted by the Army Marksmanship Unit at Fort Benning, Georgia June 7-12 2015. The team was led by Lt. Col. David Schultz and Command Sgt. Maj. Steven Slee with firing members Maj. Luis Garcia, Maj. Patrick Sleem, Capt. Thomas Bourne, 1st Lt. Davy Simanjaya, Master Sgt. Robert Mango, Sgt. 1st Class Kristopher Beerman, Sgt. 1st Class John Buol, Staff Sgt. Jonathan Rosene, Staff Sgt. Richard Willis, and Sgt. Zachariah Smith. USAR Blue made up of of firing members Sleem, Bourne, Mango, Beerman, Buol, and Rosene managed consistent top five finishes in every team match including a third overall in Service Pistol. Top individual shooters were Mango – with top five finishes in the .22 Overall Aggregate, Service Pistol Overall Aggregate, and Grand Overall Aggregate – and Rosene who took second in the .22 Overall Aggregate. 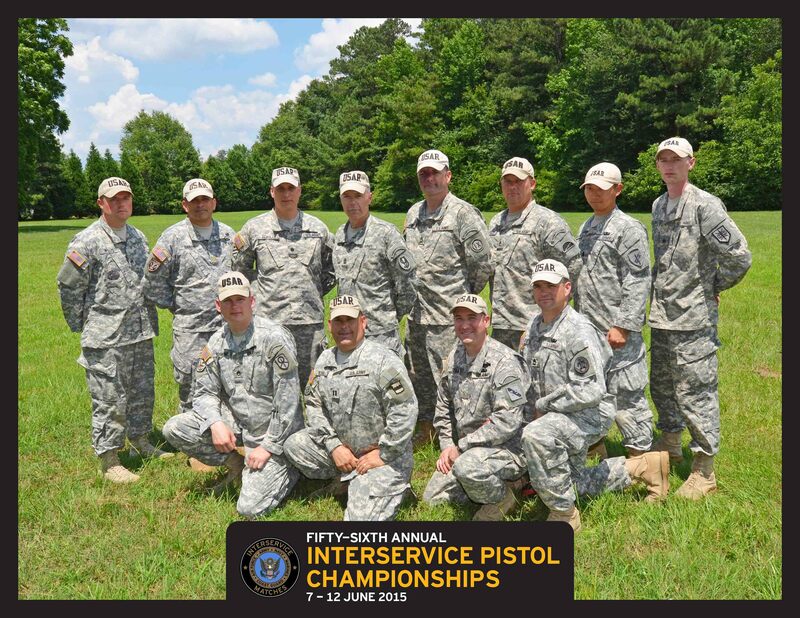 Army Reservist Soldiers competing in the 56th Annual Interservice Pistol Championships. Front row: Staff Sgt. Jonathan Rosene, Capt. Thomas Bourne, Maj. Patrick Sleem, Sgt. 1st Class John Buol. Back row: Staff Sgt. Richard Willis, Maj. Luis Garcia, Lt. Col. David Schultz, Command. Sgt. Maj. Steven Slee, Master Sgt. Robert Mango, Sgt. 1st Class Kristopher Beerman, 1st Lt. Davy Simanjaya, Sgt. Zachariah Smith. This entry was posted in Service Pistol and tagged FY15-summary.